Another candidate for PA Lieutenant Governor? The solution to gun violence is simple but not attainable. The only firearms that should be allowed are shotguns and bolt action rifles. No one needs an assault rifle with a 30 round magazine or a handgun. PoliticsPA is reporting that the DCCC had a poll of former 10th CD Congressman Chris Carney vs. 11th CD Congressman Lou Barletta recently without any numbers. We went through this last time. Don't get your hopes up Carney fans as he is not running for Congress or Lt. Governor which is laughable.. He spent 2 terms in Congress and cashed in becoming as a lobbyist with a defense contractor in Virginia. Every time one of these stories pops up he can't be reached by reporters or bloggers which tells you something. via Think Progress: Congressman Tom Marino wants to impeach Harry Reid because he is mad about the budget or something. MARINO: I’ve made a suggestion that we should at least start talking about impeachment. I had my office staff do it. But we cannot find anything that permits the House to bring impeachment proceedings against Harry Reid. There’s nothing in the legislation we can find at this point to force him to vote or come up with a budget or anything like that. His membership in the Senate can call for a vote of “no confidence,” but we can’t even get a Republican senator to do that. Also there is nothing in the Constitution about a "no confidence vote." That can happen in the British Parliament but not the US Congress. A few months ago 11th CD Congressman Lou Barletta stated that the President could veto a Constitutional amendment. Article V of the US Constitution says that an amendment must be passed by two thirds of the House and Senate then ratified by three fourths of the State Legislatures. Barletta also wants to deny birthright citizenship guaranteed by the 14th amendment. H.R.140, the “Birthright Citizenship Act of 2013,” seeks to bar children of non-citizens born in the United States from gaining citizenship rights. If this was applied retroactively I would not be an an American citizen as my grandparents were not American citizens when they came to the the USA . My Mother and Father would not be American citizens even they were born in this country to foreign born parents. State Senate Majority Leader Dominic Pileggi (R-Delaware)just won't give up. 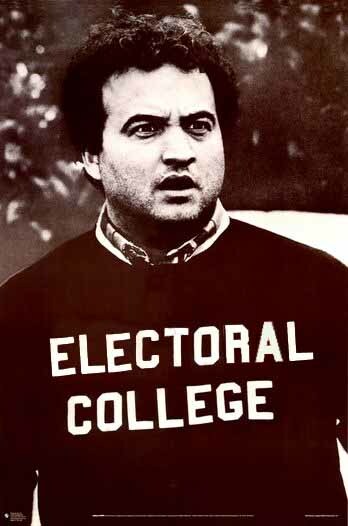 After his plan to award Pennsylvania's electoral votes by Congressional District went no where he is back with a plan to divvy them up proportionally. If this system was in place last year President Obama would have received 12 EV's to Govenor Romney's 8 instead of all 20 going to the Democrats. It's easy to see how this plan could backfire. Although PA has voted for the Dems in the last few elections it's not inconceivable that the GOP nominee could win the Commonwealth in 2016 but split the EV's with the Democrat and deny him/her the White House. The other danger is that the 2014 State Legislature races could be nationalized. If this bill passes I can see every Democratic interest group in the country getting involved pouring lot's of money into those races. Forget the groundhog or the equinox, the first sign of Spring is Baseball! Today there was the first game between the Phillies and Astros . 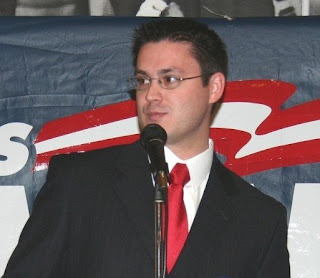 Congrats to Frank Mazza who has been elected to succeed Bob Zaruta as Chairman of the Luzerne County Young Republicans. Bob has led the group in a conservative direction declining to endorse some Republican candidates. Bob tells me he is looking at starting an internet venture. The Luzerne County Democratic Committee will host a Candidate Forum on Thursday February 28th, 6:30PM at Grotto Pizza outside the Wyoming Valley Mall. Democratic candidates for County office are invited to meet with members of the Executive Committee. And the Young Dems will meet Wednesday at Rodano's on Public Square in Wilkes-Barre at 7PM. Towanda, PA - Second-term Bradford County Commissioner Mark Smith will seek the 2014 Democratic nomination for Lieutenant Governor. He announced his candidacy at The Weigh Station Cafe in downtown Towanda this afternoon. From 2008 to 2011, Mark Smith served as Chairman of the Bradford County Board of Commissioners, overseeing enormous economic development and job growth, while leading important government modernization and reform initiatives. He was only the second Democrat ever to be elected Chairman. Under Smith’s watch, Bradford county's private sector employment increased by 15%, while statewide and national employment decreased by 2% and 4%, respectively. During those years, Bradford County had the second-best employment growth in the state. As Bradford County became the number one county in the state for Marcellus Shale development, Smith became a recognized expert on the state, regional and local impacts of the natural gas industry. He has been an outspoken critic of the Corbett administration and Department of Environmental Protection's failures to properly engage with county and local leaders on the oversight and regulation of the natural gas industry. He was a strong supporter of a tax on natural gas, which was needed revenue for communities across the shale region to meet the increased demands from growth. While serving as Commissioner, Smith cut taxes, passed four balanced budgets, refinanced the county's debt and revamped the county's energy usage and efficiency policies, saving taxpayers millions of dollars. Before entering public service, Smith was an industrial design engineer. He grew up in Ridgebury Township in Bradford County and studied industrial design at the Art Institute of Pittsburgh and then at the College for Creative Studies in Detroit, Michigan. He is also continuing his education working toward a business degree. Smith is an accomplished musician who plays lead guitar in the rock band, One Floor Away. The band is currently signed with the studio New Vine Media where they are recording their first album. Smith looks forward to a spirited campaign, but more importantly, he is looking forward to his June wedding when he will marry his fiancé, Wilkes-Barre native, Jane Clements. I'm running for re-election to move into phase two of laying the foundation for Home Rule government. I see it somewhat like highway paving: We're laying the smooth macadam over the more dense stone foundation. --transitioned into our Home Rule form of government from the commissioner system. --hired our first professional manager, who was the most outstanding candidate. --passed two budgets, the first of which was initially handicapped by a $3million shortfall. --earmark any budget surpluses to specifically pay down our $400 million debt. --hire the best candidates for charter-mandated division heads. --agree upon a written vision for a 5, 10, and 20 year countywide plan. --continue to bring decency and respect to county government. Our campaign's kick off event will be at Rodano's on public square on Thursday, February 28 from 6-7:30. Fellow Republican candidates for all offices are welcome to bring their petitions. My name is Alex Milanes and I know what The American Dream is. Fleeing Castro’s Cuba, my family settled in Northern New Jersey without a penny to their names. Within a few years, my grandfather would open an electronics store and my cousin would start a fencing business. Kenny Electronics and Delta Fence Company would eventually grow into successful businesses. I lived with my parents in an apartment over my grandfather’s store, and spent my youth in the shop, running errands and witnessing the hard work and long hours my grandparents logged each day. After graduating high school, I started working for my cousin at Delta Fence Company. Through these experiences at an early age, I can attest that hard work and discipline were the keys to realizing the American Dream. When my work with Alliance Inspection Management brought me to Pennsylvania, I lived first in Philadelphia before moving to Easton and then Wilkes-Barre, where I found a home. For the past few years I have involved myself in local Luzerne County politics. I serve currently as the Secretary of the Luzerne County Republican Party, as well as representing the 6th District in the party’s grievance committee. I also serve as the Treasurer of the 6th District and represent the first ward of Wilkes-Barre Township in the Luzerne County Republican Committee. I am a believer of supporting our veterans and currently an associate member of the Marine Corps League Detachment 412 “Black Sheep”, Social member of The American League Mountain Post 781 and a supporter of Vets to D.C. I am also an active member of the Luzerne County Historical Society. I want to make the American Dream that allowed my family to rise from nothing available to everyone who is willing to work hard and play by the rules. I believe that immigration is the lifeblood of this country, and I am the only candidate that will make sure the interests of ALL people in Luzerne County are represented on the Council. I have a proven record of building bridges and serving the people of Luzerne County. Harry Haas (R) will be running for another term and will have a meet and greet at Rondano"s Thursday February 28'th from 6 to 7:30 P.M.
Linda McClosky Houck(D) is in for another term. Elaine Maddon Curry(D) has had enough and will not seek reelection.. Eugene Kelleher (R) will run for reelection. Democrats Eileen Sorokas and Renee Ciaruffoli-Taffera said they will run for county council. Republicans Kathy Dobash and Alex Milanes are also mounting campaigns. A few weeks ago Harrisburg city councilor Brad Koplinski dropped his announcement for Pennsylvania Lt. Gov. in my inbox. I never heard of the guy but appreciate that he included me in his media list. I was very pleased that he accepted my invitation to Blogfest on April 19th. Yesterday I got a teaser from another guy I never heard of. "This Thursday, Democratic Bradford County Commissioner Mark Smith will make a major announcement that could have long-term impacts on Bradford County and the Commonwealth of Pennsylvania. For several years, Bradford County has been the number one county in the state for Marcellus Shale development, job growth and impact. Smith has become a recognized and outspoken expert on the statewide, regional and local impacts of the natural gas industry." I can't make it because of my work schedule but I'm going to make a wild guess that he is announcing that he is running for Lt. Gov. We hope to see him at Blogfest. February 19th is the first day to circulate petitions for Luzerne County Council, Wilkes-Barre Area School board and a myriad of other local office's. You have to turn them in by March 13th then have until March 27th to change your mind. The Luzerne County 6th District Republican Committee announces a petition night for registered Republican Candidates seeking county-wide office, or seeking office within the 6th District (Ashley, Hanover Township Ward 2, Plains Township, Wilkes-Barre, Wilkes-Barre Township). Republican-registered candidates are encouraged to attend and should bring their petitions to gather Republican signatures. As predicted there will be many people running for School Board this time. The first to announce is my pal Jim O'Meara. Expect many more. My name is James O’Meara Sr. and I am running for Wilkes-Barre Area School Director. I am a 1975 graduate of Wyoming Area. I’ve lived in Plains Township since 1984. I attended Penn State as an undergraduate. I also attended College Misericordia (now Misericordia University) during the early years of my marriage. In each case I left college to work full-time. I have a lot of credits, but no sheepskin. Both of my children attended Wilkes-Barre Area schools and both graduated from James M. Coughlin High School. Over the years, I advanced in my careers through hard work and my own initiative. I haven't been afraid to take chances. I currently work in retail sales and run a small business. I also have sixteen years of information services experience (including management) under my belt. Like many other Americans in these uncertain times, I have experienced the challenges of joblessness. I know what it is like to face the cruel economic uncertainty that comes with the loss of a job. I am deaf, but my hearing was restored with bilateral cochlear implants. The first thing I did after getting my hearing back was run for office. I relished the chance to once again talk with …and especially listen to …thousands of people in a door-to-door campaign for state representative. As a candidate for school director, I will campaign the same way. I will listen to what you have to say. And I will take your message with me to every school board meeting. I have one young grandchild, and another is due any day now. I worry about the quality of education they will receive in the years ahead. I am concerned that the education of our children and grandchildren is being compromised in the Wilkes-Barre Area School District. I believe the Wilkes-Barre Area School Board has a long way to go in meeting this constitutional mandate. The Citizens’ Voice reported in June, 2012 that Wilkes-Barre Area “…is the only school district in the entire seven-county region that failed to meet the state average in any of the 20 Pennsylvania System of School Assessment tests or the SAT for the 2010-2011 school year.” From where I sit the district gets a failing grade for delivering a thorough system of public education. As to the efficiency mandated by our state constitution, the failures there border on the spectacular. Just days ago, the Citizens’ Voice reported that Wilkes-Barre Area’s billing requirements were so derelict that a forensic audit couldn’t resolve whether the former solicitor overbilled for more than half a decade. In other words, it was impossible for the auditor to figure out whether the district was robbed, careless or both. Last November, the Wilkes-Barre Times Leader lambasted five members of the board for “…refusing to recognize and prohibit the destructive influence of nepotism on a public institution.” In recent news, one board member is voting from half a world away. This is a school board badly in need of a shake-up. It’s time for some common sense leadership. It’s time for voters to send a clear message that politics as usual in the Wilkes-Barre Area School District must end. I look forward to delivering this message personally in November, and I ask for your support. Jim has previously run for State Rep and Plains Township Commissioner.He was the campaign manager for Laureen Cummings Congressional bid. The latest outrage from the Wilkes-Barre Area School Board is Bob Corcoran voting by Skype from his new home in Germany. It may be technically legal to attend a board meeting by video conferencing because of a temporary absence but this is ridiculous. As PB put it: One thing you have to say for the WBA school board, it never fails to amaze or, in this case, amuse, make that disgust. Three members of the board want him removed but that may take months. His seat is up this coming election and it is safe to assume that he won't be running for reelection but anything can happen. The honorable thing to do is resign but be we are talking about the W-B Area School Board and there are people to be hired. In addition to Corcoran, Christine Katsock, Lynn Evans and Phil Latinski are up for reelection. Evans said she is not running. Expect a big field in the upcoming primary but the key is winning a double nomination making the general election a foregone conclusion. Alex is the son of Cuban immigrants that landed in New Jersey via Spain and said he wants to be the Hispanic face of the local GOP much as Marco Rubio is trying to be the Savior of the national Republicans according to Time. The difference is that Alex is rational person who understands the need for compromise to make government function. He tossed out a few ideas at our meeting tonight to raise revenue such as a tax amnesty for delinquent property owners and expressed reluctance to slash county jobs sacrificing customer service. Milanes doesn't support the recent move to cut out the local tax collectors saying it needs more study. His reluctance to tow the party line got him kicked out of the local Young Republican outfit. He has been a regular at Blogfest. But we can’t ask senior citizens and working families to shoulder the entire burden of deficit reduction while asking nothing more from the wealthiest and the most powerful. (Applause.) We won’t grow the middle class simply by shifting the cost of health care or college onto families that are already struggling, or by forcing communities to lay off more teachers and more cops and more firefighters. Most Americans -- Democrats, Republicans, and independents -- understand that we can’t just cut our way to prosperity. They know that broad-based economic growth requires a balanced approach to deficit reduction, with spending cuts and revenue, and with everybody doing their fair share. And that’s the approach I offer tonight. I realize that tax reform and entitlement reform will not be easy. The politics will be hard for both sides. None of us will get 100 percent of what we want. But the alternative will cost us jobs, hurt our economy, visit hardship on millions of hardworking Americans. So let’s set party interests aside and work to pass a budget that replaces reckless cuts with smart savings and wise investments in our future. And let’s do it without the brinksmanship that stresses consumers and scares off investors. (Applause.) The greatest nation on Earth cannot keep conducting its business by drifting from one manufactured crisis to the next. (Applause.) We can't do it. Now, most of us agree that a plan to reduce the deficit must be part of our agenda. But let’s be clear, deficit reduction alone is not an economic plan. (Applause.) A growing economy that creates good, middle-class jobs -- that must be the North Star that guides our efforts. (Applause.) Every day, we should ask ourselves three questions as a nation: How do we attract more jobs to our shores? How do we equip our people with the skills they need to get those jobs? And how do we make sure that hard work leads to a decent living? A year and a half ago, I put forward an American Jobs Act that independent economists said would create more than 1 million new jobs. And I thank the last Congress for passing some of that agenda. I urge this Congress to pass the rest. (Applause.) But tonight, I’ll lay out additional proposals that are fully paid for and fully consistent with the budget framework both parties agreed to just 18 months ago. Let me repeat -- nothing I’m proposing tonight should increase our deficit by a single dime. It is not a bigger government we need, but a smarter government that sets priorities and invests in broad-based growth. (Applause.) That's what we should be looking for. I’m also issuing a new goal for America: Let’s cut in half the energy wasted by our homes and businesses over the next 20 years. (Applause.) We'll work with the states to do it. Those states with the best ideas to create jobs and lower energy bills by constructing more efficient buildings will receive federal support to help make that happen. And that has to start at the earliest possible age. Study after study shows that the sooner a child begins learning, the better he or she does down the road. But today, fewer than 3 in 10 four year-olds are enrolled in a high-quality preschool program. Most middle-class parents can’t afford a few hundred bucks a week for a private preschool. And for poor kids who need help the most, this lack of access to preschool education can shadow them for the rest of their lives. So tonight, I propose working with states to make high-quality preschool available to every single child in America. (Applause.) That's something we should be able to do. So tonight, I ask Congress to change the Higher Education Act so that affordability and value are included in determining which colleges receive certain types of federal aid. (Applause.) And tomorrow, my administration will release a new “College Scorecard” that parents and students can use to compare schools based on a simple criteria -- where you can get the most bang for your educational buck. Of course, what I’ve said tonight matters little if we don’t come together to protect our most precious resource: our children. It has been two months since Newtown. I know this is not the first time this country has debated how to reduce gun violence. But this time is different. Overwhelming majorities of Americans -- Americans who believe in the Second Amendment -- have come together around common-sense reform, like background checks that will make it harder for criminals to get their hands on a gun. (Applause.) Senators of both parties are working together on tough new laws to prevent anyone from buying guns for resale to criminals. Police chiefs are asking our help to get weapons of war and massive ammunition magazines off our streets, because these police chiefs, they’re tired of seeing their guys and gals being outgunned. Each of these proposals deserves a vote in Congress. (Applause.) Now, if you want to vote no, that’s your choice. But these proposals deserve a vote. Because in the two months since Newtown, more than a thousand birthdays, graduations, anniversaries have been stolen from our lives by a bullet from a gun -- more than a thousand. WASHINGTON, DC – Tonight, President Obama presented a vision to the American people of a stronger Union, a foundation for prosperity, and a thriving middle class. Working together, we will adopt a bold agenda for our economic growth - founded on good-paying manufacturing jobs, greater access to education, critical investment in our nation’s infrastructure and a future of clean energy. Despite signs of progress in our economy, too many Americans are out of work and struggling to make ends meet. Sustaining a secure and prosperous middle class is the defining challenge of our time. To rebuild the middle class, we must make America a magnet for good-paying manufacturing jobs, provide access to the skills needed for all Americans to compete in today’s global economy and make sure that hard work produces a good standard of living and long-term financial security. Education is the greatest investment we can make in our country and is key to rebuilding our middle class. It’s critical that we provide greater access to early childhood education and that we open doors to collegiate opportunities for all Americans. Education is the crown jewel of our nation’s economic infrastructure. We cannot sacrifice our children’s future. Immediate investment must also be made in improving our nation’s crumbling transportation infrastructure. There is no such thing as a Republican bridge or a Democratic bridge: only the bridge we all travel over together. Investing in our infrastructure, allowing us to compete with countries across the world and providing jobs today, is imperative and is something we can and should all agree on. But, we need to invest in the technologies and economic strategies of the future. Clean energy creates jobs that you can’t ship overseas, and in turn boosts the economy. We must continue toward becoming fully energy independent and we need to lower energy costs to keep more money in the pockets of middle class families. Every step along the way, we must demand fiscal discipline - examining all unnecessary spending, but an indiscriminate across-the-board cut is the wrong approach. We can't just cut our way to prosperity or a strong middle class. Both sides need to work together with President Obama to provide a plan for a stable financial future. With his powerful words tonight, the President demanded that we fulfill our promise to fight for the interests of America's families, rebuild the keystones of progress, and restore opportunity to every American. Working together, we can realize a vision of growth, security and economic success for all Americans.